A large crowd gathered by the Cannon River in the center of Northfield, Minnesota to witness a popular attraction at the 2010 Vintage Band Festival (VBF): The Battle of the Bands. Staged at high noon on Saturday, August 7, 2010, the two participating bands, the 1st Brigade Band of Wisconsin and Newberry’s Victorian Cornet Band, set up on opposite banks of the river and took turns performing. Described by VBF Director Paul Niemisto as “more of a conversation than a battle,” the history behind the event is described in an interesting article by Rob Hardy on Northfield.org. When the 30-minute “battle” was over all of the band members convened on the main bridge across the river to shake hands and then we all shared a nice lunch together sponsored by the festival. Thanks to the generosity of Northfield resident Carl Behr, I was able to create a brief video of the event to post here. Thanks for sharing your footage and for all of your wonderful photos, Carl! Through the courtesy of Northfield resident Dan Bergeson, here is another video from the Battle of the Bands. Shot from across the river, it shows the Newberry Band performing the rousing Finale from Act II of Verdi’s Atilla arranged by J. B. Claus. In addition to filming the band, Dan did a great job of showing the crowd along the river, and you really get a sense of how windy it was that day. Thanks, Dan! 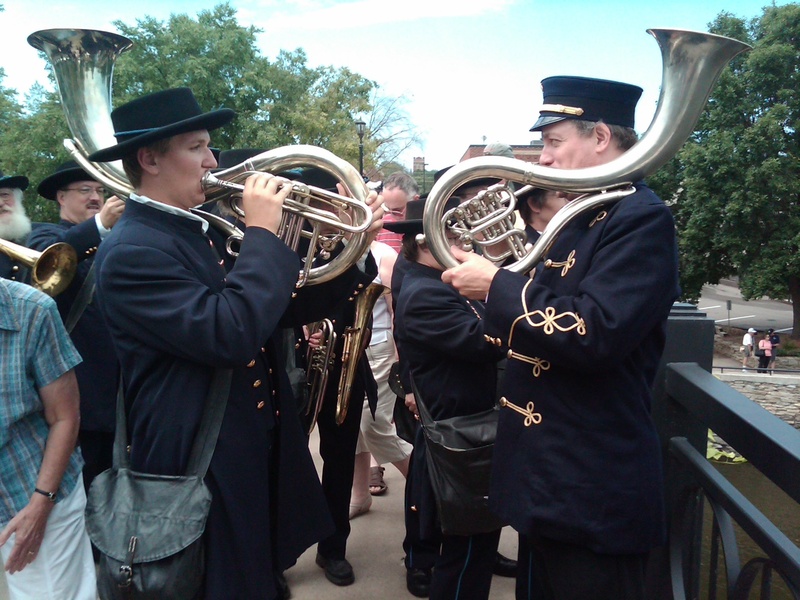 We love your group and are coveting those gorgeous low brass instruments, Elisa! !